An Edinburgh delivery worker threatened to kill his neighbour’s family and pets - after her noisy chickens kept waking him up early in the morning. Steven Ramage, 34, lost the plot after his sleep was disturbed by Caroline Boyle’s feathered pets which were housed in a coop opposite his home in Craigentinny. Ramage confronted Miss Boyle about her birds’ early morning squawking but ended up shouting he would take out her family after she refused to do anything about the noise. Ramage, who was working as a delivery driver at the time, also said he would kill the terrified woman’s two dogs and her two chickens if she failed to stop the birds’ early morning clucking. Miss Boyle, 60, was left frightened by Ramage’s outburst last July, and after another neighbour said she had overheard the argument she decided to call in the police. Ramage denied the allegations and stood trial at Edinburgh Sheriff Court and was eventually found guilty of behaving in a threatening or abusive manner towards the woman. Miss Boyle told the court she has two dogs and kept two chickens in a coop in her front garden. 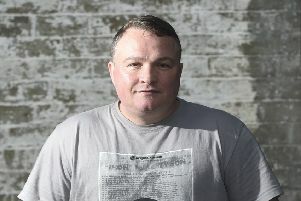 The former Edinburgh City Council employee described the incident when Ramage turned up at her door: “I was watching TV when I heard a noise at the door. I saw Mr Ramage at the door and when I opened it he was in a frenzy. “He verbally abused me and said he was going to kill my family and my pets. She said the tirade continued out into the street and ended with Ramage shouting, “If I lose another night’s sleep due to those f*** ing chickens I am going to kill them”. Neighbour Clare Kelly, 27, told the court she witnessed Ramage’s outburst and heard him “threatening to Caroline, her family and her chickens”. Ramage claimed the chickens woke him up around 5am and he decided to visit Miss Boyle’s flat to complain after his previous calls to the local authority and the Scottish SPCA failed to stop the bird noise. He said: “I was not angry, more frustrated. I just wanted her to cover the coop with a black cover. Ramage’s brother Scott, 39, told the court he had warned Ramage not to go over to Miss Boyle’s home but added there had been no shouting or swearing between the pair. Following all the evidence being heard Sheriff Robert Fife found Ramage guilty of the charge. Sheriff Fife said: “Miss Boyle was a reliable and credible witness and Ms Kelly was a credible and reliable witness and in my view she was an impressive and objective witness. “I did not believe the accused. His evidence left more questions unanswered than answered and I am in no doubt he lost his temper and shouted and swore at Miss Boyle and made the threats to kill. Sentence was deferred for the preparation of social work reports to next month. Ramage was found guilty of behaving in a threatening or abusive manner by shouting, swearing and uttering threats of violence at Loganlea Place, Edinburgh, on July 19, 2018.